Millard Fillmore Suburban Hospital has continually tailored its programs and services to meet the specific needs of the community. With expert surgeons and operating room staff, upgraded surgical suites and the most advanced technology including robotic surgery, Suburban is sure to meet and even exceed your needs for outpatient ambulatory surgery, outpatient minor surgery and inpatient surgery. Patients are scheduled for pre-admission testing approximately one week prior to surgery and receive a physical examination and any necessary tests like blood work, urinalysis, chest X-ray or an EKG. A complete medical history will also be taken at this time. The anesthesia department will then review test results to help determine the patient's state of health. Below is a helpful checklist to ensure the pre-admission appointment is an effective and productive one for everyone involved. Write down questions or concerns when you think of them, and bring them in for discussion with the nurse practitioner. Bring your health insurance information. Bring a list of current medications, including over-the-counter and herbal products. Review current medications with the nurse to learn which medications you should and should not take prior to surgery. If you are under age 18, a parent or legal guarding must accompany you. Be prepared to spend about 90 minutes for your pre-admission visit. Surgery times are subject to change. Please provide an alternate telephone number where you can be reached should your scheduled surgery time change. Eat a normal evening meal the day before your surgery, unless directed otherwise, but DO NOT eat or drink anything after midnight – including gum or mints. DO NOT smoke the evening prior to or the morning of your surgery. Smoking causes bronchial irritation and may increase the likelihood of breathing problems during and after anesthesia. DO NOT drink alcohol for at least two days prior to surgery. Routine heart, breathing or blood pressure medications should be taken as prescribed with a small sip of water on the day of your surgery. Inform your nurse about the medications you have taken. Medications such as insulin and inhalers should be brought with you. Begin avoiding the use of aspirin or Motrin/ibuprofen products at least 10 days prior to surgery. If you take aspirin or Coumadin daily, you must talk to your physician before discontinuing the medication. Notify your physician if you are taking diet suppressant medication and follow the directions you are given. Notify your surgeon immediately if you suspect you might be pregnant. Anesthesia and medications may be harmful to a developing fetus. Report any changes in your health to your surgeon, even minor changes such as a persistent cough, cold or fever. It is normal to feel anxious before surgery. Keep in mind that our surgical teams are experts who have performed surgical procedures many times. Feel free to ask any questions, and take comfort in knowing that your safe, successful operation is our highest priority. We care about your physical, mental and emotional well-being. Bathe or shower the morning of surgery. Remove all make-up, nail polish, contact lenses and jewelry. DO NOT wear lotions hair sprays, hair gels, or perfume. Remove all body piercings. Wear loose-fitting, casual clothing and comfortable shoes. Leave valuables at home for safekeeping. A bag will be provided for personal items such as clothing, dentures or glasses. Plan to arrive as instructed by the nurse the previous afternoon. Arrival times are scheduled generally 90 minutes prior to surgery. Knowing that any surgical procedure can cause anxiety, the operating room staff does everything it can to make the process as easy and comfortable as possible. 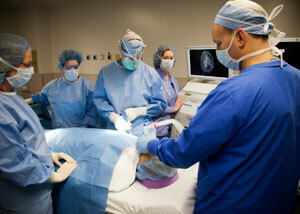 The surgical team also provides comprehensive, easy to understand education on the day of surgery. After discharge if requested, patients are called again to check on their progress and answer any questions they may have regarding their surgery. The department also coordinates the admission of all surgical patients (ambulatory, minor surgery, and overnight surgery) and can be used as a resource for common questions prior to a procedure. Monday - Friday, 6:00 a.m. to 9:00 p.m.
Saturday, 6:00 a.m. to 5:00 p.m.
Millard Fillmore Suburban offers patients the latest surgical technology with an extensive team of expertly trained surgeons performing minimally invasive and robotic surgery on both an inpatient and outpatient basis. Visit the Minimally Invasive and Robotic Surgery page for complete details of the surgeries being performed at Millard Fillmore Suburban Hospital that decrease the days spent in the hospital, speed recovery, and decrease pain and scarring compared to traditional surgery. So you can get back to being you - faster. Many of the surgical staff are nationally certified in their specialty. The surgical waiting rooms offer loved ones a calm, comfortable environment in which to wait. Volunteers are in the waiting rooms and serve as liaisons between the medical team and family. Pain may increase as the anesthesia wears off. All Kaleida Hospitals are committed to managing pain. Please communicate your pain level with your nurse, and don’t hesitate to ask for pain medication to avoid discomfort that may delay your recovery. Be sure to follow the post-operative (after surgery) instructions you are provided. Surgery can be very stressful on the body, so rest is extremely important to recovery. Your incision becomes more red, swollen or painful.